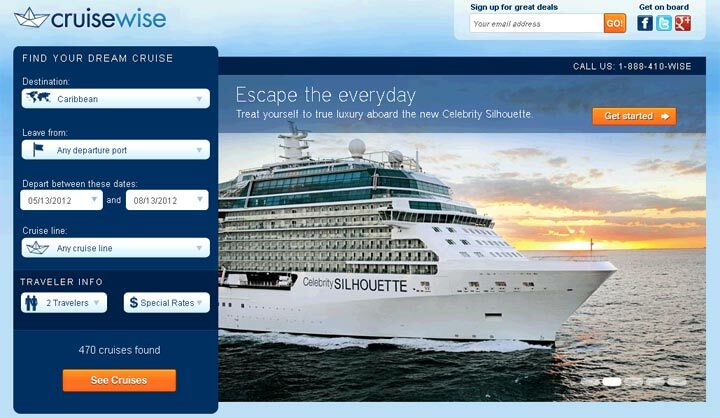 New website CruiseWise is dedicated to booking cruises and has launched today. The startup aims to simplify the online cruise booking process, bringing it up to par with what you find now when booking hotels or flights. With site’s online search engine, customers can compare prices, routes, cabin choices and other options across multiple cruise lines and see the full amount for the cruise by total number of passengers, including tax. Due to the complexities of options with a cruise ship – there can be up to 40 different cabin options alone, for example – being walked through the process through an online travel search site like Expedia takes multiple steps. In fact, cruise bookings go through 8 webpages on Expedia, versus 3 for flights. The search process is simplified, allowing you to easily compare different packages side-by-side, while also seeing the real prices. Since cruise prices are by person, that ad for a $300 discounted cruise is really $600 for a couple, plus tax. CruiseWise lets you see the full rate when you’re searching, so you can make better decisions. For now, the service is only tracking four top lines: Carnival, Celebrity, Princess and Royal Caribbean, but combined they account for 60% of the market. Six more lines will be added in the next several months, bringing that total up to 80%+ of the market. CruiseWise also includes information that helps you pick the cruise line of choice, like ship layouts with interactive deck maps, lists of amenities, photos, route information, in-depth port guides and more. The startup even employs half a dozen travel writers who create editorial content about the destinations and submit photos. Other features in the works include an improved cabin selection guide that will help you determine which cabin best suits your needs (quiet or loud? windows? sunrise or sunset view?, etc.) In the future, the service will allow for crowdsourced content and user reviews, too.